The term chicanery according to the Oxford English Dictionary suggests the use of deception or subterfuge to achieve one’s purpose. The aims and objectives of this article are to give an account of the differences between the historical praxis that we know to be seiðr from what is purely speculative re-inventions of seiðr based on eclectic New Age adaptations taken from non-Northern European Traditions to total re-inventions of something that never was? The etymology of seiðr remains disputed although etymological equivalents are known from Old High German and Old English (de Vries 1961). Those equivalent words mean ‘cord, string’ and ‘snare, cord, halter’. The skaldic poetry also has an example of seiðrin the meaning ‘cord’ or ‘girth, girdle’ (Ragnarsdrápa 15, Finnur Jónsson 1912:4). Suggesting a ‘snare, cord, string or halter but not in a binding sense. Cords can magically attract and this remains characteristic of seiðr (cf. Almqvist 2000:262ff). (3) In perhaps half of the prose sources, the effect of seiðr is that desired objects, persons or resources, like fish, are drawn to the sorcerer. Male seiδr practitioners: Seiδrmaδr (seiδrman), seiδskratti (evil seiδr sorcerer), seiδrbenδr (seiδr carrier), spamaδr (prophesy man), villusspamaδr (false prophesy man), galdramaδr (galdr man), galdrasmiδr (galdr smith), vitki (sorcerer), fjolkyngismadr (sorcerer), fjolkyngisbenr (sorcerer bearer), gandrekr (ganδrman/warrior), kunattumaδr (man who knows magic), tauframaδr (charm man). The twelfth century of Europe witnessed a paradigm shift in attitudes concerning magical practise due to the advancement of intellectual changes involving the impetus of a variety of economic, social and cultural evolution. The led to what was formerly considered demonic illusionary magical practises to be more distinctly categorised as high and low magic, white or black magic. <Ben and Constable 1982; Ward 1982> Collectively, these changes impacted on the general view today in modern paganism of the good versus evil in respect of magic workings which has stuck with us today in the modern mind-set of those who attempt to imitate or indeed reconstruct those original practices. I argue that the notions of good or evil magic simply did not exist back then for our honoured ancestors and that magic at least for those who practiced magic a thousand years ago under the auspice of seiðr either practised the seiðrcraft which carried a desired effect or had no effect just as it does today. Magic either works or it does not work for the sorcerer or witch. The idea of negative or evil magic is a modern concept based around religious Church doctrines stemming back to the Middle-Ages. But nowhere throughout either versions of the entire corpus of the Saga of Erik the Red does it mention within those pages or detail in any way whether any actual trance induced oracular spirit/god form possession ever took place with the seerest Þorbjǫg and especially on a “High-Chair”. Not one single citation but despite what we factually know from the account, a misdirection remains today by many who still view the texts within the accounts in Chapter Fours of Erík’s saga rauδa as evidence that some sort of ecstasy trance state seiδr oracular divination took place. 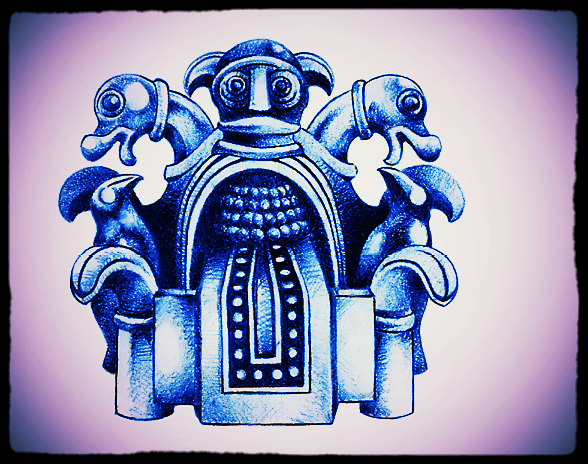 Accounts suggest that the Vǫlva Þorbjǫg was reluctant to give answers and remained silent on the first night. The actual texts show that that it took a long time before any answers came from the Lítil-Vǫlva <little seerest>, some two nights in fact but no details were ever expressed on the actual ceremony nor was the “high seat” ever emphasised in in Erík’s saga rauδa for the vǫlva to go into a prophetic trance. What was written describes the preparations for the seiδr rather than the ritual. There is no mention within the texts about the vǫlva’s soul or any journey of the soul either in ecstasy or with the body lying down in any altered state of consciousness and this is important to note. In 1874, Gubbrandur Vigfusson offered the following explanation for the term `Varδlokkur: feminine plural form (Scottish, warlock), a ward song (varllsdngur), a protection song (verndarsdngur).' He hypothesised that the Scottish word `warlock', used to describe a male magician or sorcerer, was a term derived from the Icelandic word `vardlokkur'.Dag Stromback took up the same topic in his book Sejd (1935), where he discusses the behaviour of shamans after their magical per­formances. He describes the shaman upon completion of a ceremony as being in a state of near lifeless exhaustion, and notes that a young girl would be required to recite a poem until `life returned' to the shaman's body again. He found parallels between this kind of recital and the one performed by Guðriðr at the seidr ceremony in Greenland. 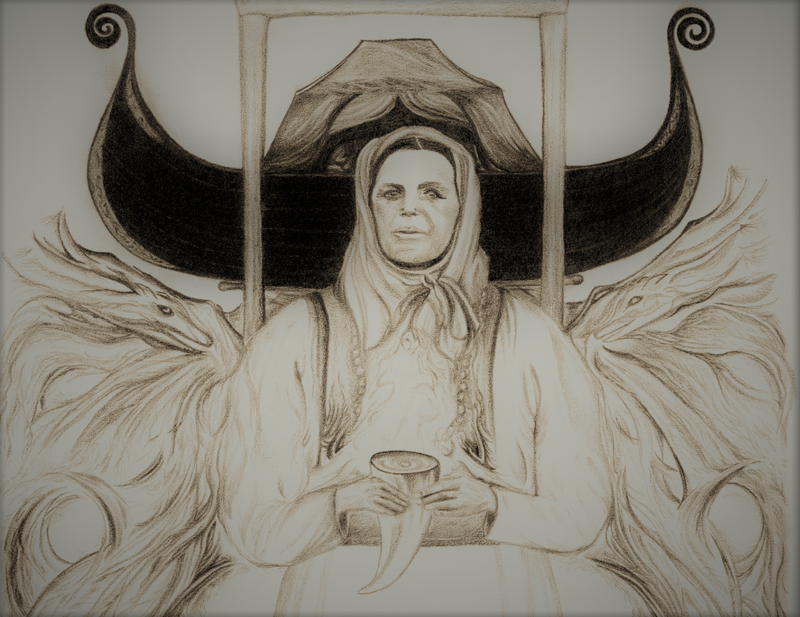 According to Stromback, the purpose of the poem that Guðriðr per­formed was to call the soul of the seeress back to her body after its journey outside the body. On the basis of this, the term `vardlokkur' would therefore have been the original name of Gubribr'S song. Trolley (1995a:61) suggested that vard is derived from vordr (pl. verdir) meaning guard, watch protector and lokkur suggests either fastenings or entice. Vard is the stem (used in compounds) derived from vǫrδr 'guard, watch, protector’. In so far as the word designates a spirit it must therefore be a 'guardian spirit’; such a use is found in modern Norwegian vord and Swedish vård (Pering 1941, 131-4). Thus an independent spirit is implied, who in some way acts as the guardian of the summoner. The plural form -lok(k)ur is to be explained as referring to the kvoeði as a collection of verses. Forms with both k and kk occur in the MSS, making two etymologies possible: lokur is the fern. pi. of loka ‘fastening’; lokkur is not recorded as an independent noun: we must assume it is a fern. pi. noun from the verb lokka ‘entice’, thus ‘enticements’.Two meanings for varôlok(k)ur are therefore possible: ‘guardian spirit fastenings’, i.e. what ‘locks the spirits in’, under the power of the summoner; and ‘guardian spirit enticements’ — the song entices the spirits to be present; it is in this sense that the author of Eiriks saga appears to have taken the word. There is little difference between these interpretations in practice, as the implied effect of summoning the spirits for consultation is the same. Strömbäck (1935, 138) argues that the meaning is the 'free-soul’ sent out by the seiðkona. He cites the parallel between the one girl in the Norse account who recites the verse, and the single girl in the Lapp accounts w ho is responsible for recalling the shaman’s spirit. However, that there is only one girl singing in Eiriks saga is specifically mentioned as unusual, and her role there is clearly not to recall the seiðkona’s spirit. Moreover, there seems no reason why a free soul should be designated by a word meaning 'guardian', for which nomenclature no evidence exists from the Old Norse period (later uses of vǫrδr, as noted by de Vries (AR § 160), no doubt result from confusion betw een independent spirits and the soul, probably under the influence of Christian antipathy to the idea of independent spirits employed by witches). In Gg 7 Gróa sings a charm called 'Urdr’s lokur : lokur here implies the sense 'spells’; the poet also plays on the sense of 'lock, hold fast’, for the next word is halda ‘hold, keep safe’. Urdar lokur is similar in sound to varðlokur, it is likely that the poet has deliberately remodelled a no longer understood traditional word vardlokur (or perhaps by an even closer *varδarlokur: in com pound forms the genitive ( vardar) could as well be used as the stem (vard)) bringing in fate in the person of Urðr (the poet’s mention of Urôr is deliberate: she is m entioned again at the end of the poem , indicating a structural use of fate)Young girls were in my opinion selected and trained from a very early age as all the knowledge of her mentor took many years to master and become accomplished in. This remains in vast contrast to the 101 vodoun later day occult role players who attempt to pass themselves off today as seiδkonas after only a few choice lessons at play-acting being possessed by a late Iron Age Nordic god/goddess on a so called improvised "High-Chair". What is important to know is that the Greenland Saga does nor support modern day claims of being possessed or falling into a trance spirit possession state. This is a hybrid modern addition and noting to do with the seerest of that account. It's pure fabrication. Note also that the knowledge of these early holy healers varied by time, place and personal experiences of each and ever historical Vǫlva. Just as there are really good doctors out there today as well as some lesser talented ones~when you consider for a minute that modern medicines and treatments was done by trial and error over several generations, the same must have also applied back to those early days..
Odin from Lejre is a small cast silver figurine from approximately 900 C.E., depicting an individual on a throne wearing a floor-length dress, an apron, four bead necklaces, a neck ring, a cloak and a rim-less hat. Two birds are seated on the armrests and the back of the throne features the heads of two animals. The clearest example is Saxo’s (109) version of the seiðr séance in Hrólfs saga kraka which cites “perita augurii femina” or “a woman skilled in augery”. A fornaldarsaga taken from around 1400 but has analogues in other sources. Strömback (1935:84) view Saxo version as a closer preservation of the more ancient arts such as falling down as if dead which got substituted at some point within the Icelandic sagas by falling off the seiδrhjallr. The prophetess’s task is to see where two boys are hiding, and Saxo says that they are “drawn out of their recess by the weird potency of the enchantress’s [sic] spells and pulled under her very gaze” (Fisher and Davidson 1979–80 I:202). In Chapter three of Hrólfs saga kraka, King Froδi engages a vǫlva to reveal what is happening with the two boys who happen to be his nephews as well as his enemies from who King Froδi has usurped the throne. 1) The seiδr described in Erík’s saga rauδa was dominated exclusively by women and that their collective collaboration was necessary to achieve the desired outcome. 2) The actual seiδr ritual praxis remains vague with many questions still unanswered regardingthe vǫlva’s actual divinatory process. This sorcery, when it is performed, brings with it such great ergi that engaging in that did not seem to men to be without shame, and that accomplishment was taught to priestesses’; ed. Bjarni Adalbjarnarson 1941–51, I 19). Old Norse: Óðinn kunni þá íþrótt, er mestr máttr fylgði, ok framði siálfr, er seiðr heitr, en af þuí mátti hann bita ørlög manna ok óorðna hluti, suá ok at gera mönnum bana eða óhamingiu eða vanheilendi, suá ok at taka frá mönnum vit eða afl ok gefa öðrum. En þessi fiölkyngi, er framið er, fylgir suá mikil ergi, at eigi þótti karlmönnum skammlaust við at fara, ok var gyðiunum kend sú íþrótt. One of the magic words for which there is no male form, suggesting its original meaning was close to "diviner, soothsayer," which were always female in northern European paganism, and hægtesse seem at one time to have meant "woman of prophetic and oracular powers" If the hægtesse once was a powerful supernatural woman (in Norse it is an alternative word for Norn, any of the three weird sisters, the equivalent of the Fates), it might originally have carried the hawthorn sense. Later, when the pagan magic was reduced to local scatterings, it might have had the sense of "hedge-rider," or "she who straddles the hedge," because the hedge was the boundary between the civilized world of the village and the wild world beyond. The hægtesse would have a foot in each reality. Even later, when it meant the local healer and root collector, living in the open and moving from village to village, it may have had the mildly pejorative Middle English sense of hedge- (hedge-priest, etc. ), suggesting an itinerant sleeping under bushes. The same word could have contained all three senses before being reduced to its modern one. 3) Eldar Heide, “Spinning seiðr” (paper presented at the international conference Old Norse religion in long-term perspectives. Origins, changes, and interactions, Lund, Sweden, June 3–7, 2004). 4) Swedish scholar, Sven B. F. Jansson, carried out a detailed comparison of the two versions of "Erik the Red’s Saga". Jansson, conclusion is that Hauk had edited a manuscript more or less identical to the Skálholt Book. Hauk made notes in the margin and clarified and added to some passages, and he is more specific with a suggestion that Hawk may have been drawing on surviving aspects of his own personal family tradition. 5) Ynglinga saga is a legendary saga, originally written in Old Norse by the Icelandic bishop, poet and historian Snorri Sturluson about 1225. It is the first section of his Heimskringla. It was first translated into English and published in 1844 by Samuel Laing. 6) Grágás seems to have been used until 1262–1264 when Iceland was taken over by the Norwegian crown. Grágás never actually existed in any one complete volume during medieval times. The laws are preserved in two separate manuscripts, Konungsbók (written c. 1260) and Staðarhólsbók (written c. 1280). The 1852 edition of Grágás is based on the Konungsbók text.